Jessica Taggart, lab coordinator at the Cognitive Development Labs, brought the idea for the Connecticut Science Center partnership to Barth and Shusterman. As an undergraduate at Johns Hopkins University, Taggart had been instrumental in setting up a partnership with the Maryland Science Center, which is one of the “hub sites” of the National Living Laboratory Initiative. The initiative, developed at the Museum of Science in Boston in 2005, receives support from the National Science Foundation to bring child development research into science museums around the country. The Wesleyan Cognitive Development Labs’ partnership with the Connecticut Science Center is currently an auxiliary site of the Living Labs Initiative. “Part of the Living Labs Initiative mission is sharing developmental science—which is highly accessible and interesting to families, yet is rarely covered in science museums—with the public,” said Barth. 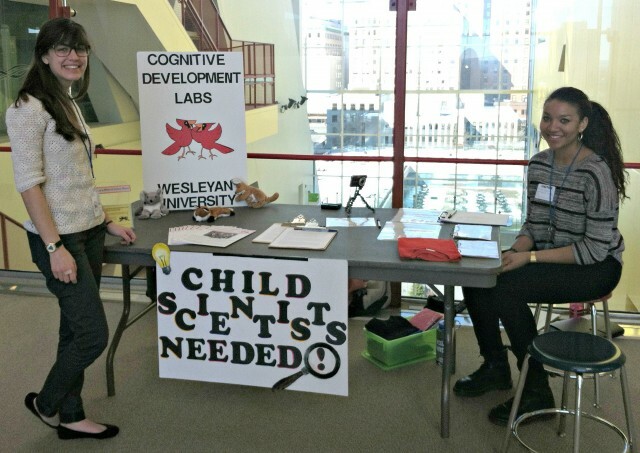 Taggart has been in contact with the Connecticut Science Center about partnering with Wesleyan’s Cognitive Development Labs since fall 2012. Beginning in March, undergraduate research assistants from the lab have had a regular presence at the science center, interacting with families and children. They are conducting a study on how group affiliation affects children’s perceptions of fairness. “We’re acting as an exhibit on child development at the museum,” said Barth. Families can stop by the exhibit to chat with the researchers about the study. If they wish, their children can participate in the study as well. According to Barth, over the course of eight 3-hour sessions at the science center, the researchers have had more than 100 children participate in the study. They have engaged more than 50 other families in discussions about the research. Jillian Roberts ’15 is the lead undergraduate researcher on the study and a Hughes Fellow. She began working at the Connecticut Science Center in the spring and is continuing through the summer, twice a week. In the study now being carried out at the Connecticut Science Center, Roberts and other researchers present a child with a red or blue T-shirt to wear during the game. They then show the child a photograph of two kids; one is “wearing a blue shirt, just like you,” they tell the child, while the other is wearing a red shirt. The experiment then builds off of previous research, which has demonstrated that children automatically infer a group affiliation with others wearing the same colored shirt. This is known as “minimal group” affiliation, because the groups have no prior history, so there is no chance for children’s existing group biases to play a role. The researchers present the child with a series of pictures showing red plates and blue plates with different distributions of candy, and the child is asked to choose which plates to give the imaginary children in the photograph. When the two plates contain uneven numbers of candy, the child will give preferential treatment to the imaginary child wearing the same color shirt as him. But when given a chance to present both imaginary children with equal numbers of candy, the child will often choose the equitable option. The researchers have noted that younger children are averse to the equitable option when it involves neither imaginary child getting any candy, while older children seem to understand that this is the fairest option (even if it means no one gets candy). Roberts and Taggart explained that this experiment was designed specifically to be carried out at the Connecticut Science Center. It is ideal in that it is very short, requires little in the way of technology or paperwork, and is accessible to everyone. Taggart noted that they’ve encountered a few parents who declined to participate in the study because they were wary of research being done on their children.